As members of the Catholic community, one reality that we meet today is that of the challenge of transmitting the faith to younger generations. Every generation and age of the church has its challenges and this is certainly one for our age. Perhaps for one of the few times in history we are being asked to witness to faith in Jesus Christ without relying so much on external supports. We live in a time where many familiar patterns, institutions, devotions and practices of faith that marked the Church in recent memory have faded or have been surpassed. While parents still carry the great privilege of this mission it is true to say that grandparents, older members of one’s extended family and even aging clergy and religious have an important role to play too. It’s hard to find a marker to distinguish what might be said to the ‘old’ from what is ‘young’ in these times. So let us not dwell in ‘years of age’ so much as one’s own perception and the feeling that you can claim a certain status and wisdom due in part to age. Thus in the context of the witness to faith that older members of the community bring, we might look today at Anna and Simeon. 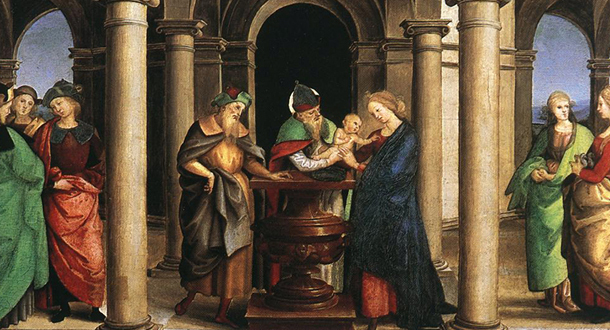 They are both very central to today’s feast of the Presentation of the Lord in the Temple, and their prominence in the gospel account is amplified by the very fact that they are elderly at this time of encounter with the newly born child, Jesus. Both Simeon and Anna are deeply devoted to God – tending to fill their days in the presence of the Lord (in as far as the Temple precinct symbolised this). Perhaps they model for us faith grown old, but not weakened. In fact they can be seen as outstanding witnesses to the Lord. It is always interesting to me, that in Luke’s portrayal of Jesus’ entry into our world, the witnesses to his true nature and mission are very specific persons. Obviously Mary & Joseph feature strongly, but in turn we see that those most trusted with this ‘good news’ are angels and shepherds and then Simeon and Anna. I do think that this is an important lesson for us. Anna and Simeon reveal to us that as we age and mature our call is more and more clearly to be a witness to faith and to its power in our lives. Further, as we age our capacity to be a witness is strengthened not diminished – we do not necessarily witness so much by actions, but by presence. Let us pray that like Simeon we too can proclaim that “my eyes have seen your salvation, which you prepared in the sight of all the peoples” and with Anna we can always give thanks to God and speak about Jesus to all who are awaiting redemption. Error: Error validating access token: Session has expired on Monday, 18-Mar-19 14:16:37 PDT. The current time is Thursday, 18-Apr-19 19:24:45 PDT.